“The Gilga-Mess” in Intergalactic Medicine Show, forthcoming this Spring. As you patiently wait for the UFO7 kickstarter campaign (which should be coming next month!) there are several anthology projects I’d like to encourage you to check out. I find myself involved in not one, not two, but three separate anthologies that are seeking funding at the moment, and I hope some of them will strike your fancy. First up is the anthology edited by Mike Ventrella and published by Fantastic Books where Mike has asked a group of funny and imaginative authors to come up with a story which has the line “Release the Virgins!” in it at some point. Some of the authors involved include David Gerrold, Allen Steele, Jody Lynn Nye, Sharon Lee & Steve Miller, and Keith R. A. DeCandido among others. If this project funds I will contribute a funny original story from the Coffee Corps universe! 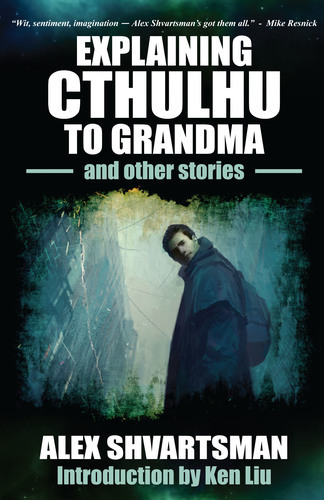 Finally, there’s another anthology of even tinier stories, also edited by Eric Fomley. Drabbledark is a collection of drabbles — stories that are exactly 100 words long. I posted about this one a couple of weeks ago and am happy to report it has reached its initial funding goal. It’s now in stretch goals and has 11 days left to pick up some more steam. In addition to all the crowdfunding news, I also learned today that my story “Ambassador to the Meek” (originally published in The Sum of Us anthology edited by Susan Forest and Lucas K. Law) has been selected to appear in Best Indie Speculative Fiction, volume 1, forthcoming in November 2018.